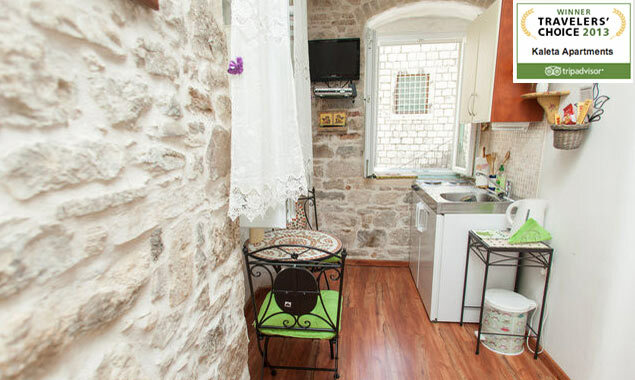 Kaleta single room studio apartment No2 is an accommodation in Split historic center within Diocletian palace walls and just 20 meters from the Golden gate. 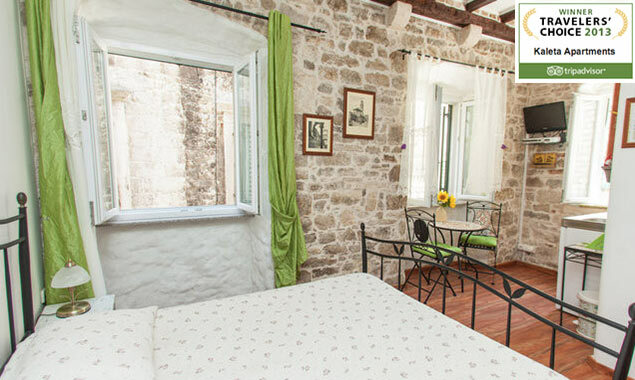 The apartment is situated on the first floor of the stone house, which is almost 500 years old. The apartment is a mixture of classic historical lifestyle and elegant modern facilities and the location makes is the top studio apartments in Split. The Kaleta apartments provides fully packed with a king size bed with all the necessary accessories like blanket, pilows, designer linens,electric kettle, kitchen with utensils and a well-equipped bathroom with all modern features. The apartment is air-conditioned with laptop computer with WiFi access for unlimited high speed internet.The apt is decorated with some artwork which enhances the elegance of apartment. 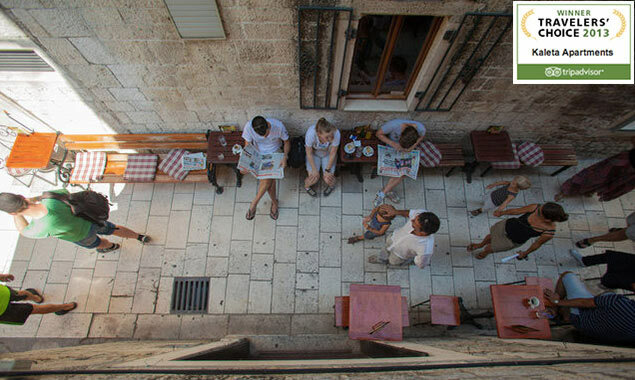 "PIECE OF HEAVEN IN DIOCLETIAN PALACE"
If You are coming to Split please stay in Kaleta Apartments, You won't be sorry! I stayed there for 5 days and it was cheery on top of my visit to Croatia. Apartments are just wonderfull and You will find everything You need and more for makeing Your stay perfect. I was welcomed by a very nice lady who explained everything we need to know to feel like locals. She told us which beaches, restaurants and museums we should visit on our stay to Split All in all the place is worth every penny and we really enjoyed our stay there.However we I am very sorry to read a bad review for these place because of my mistake! On my last night there I accidentally put something in the toilet and it got stuck! The whole bathroom flooded. I immediately called the owners and they were there 10 minutes after to help me with my problem. They manage to take out of the water but the toilet couldn't be used.So guarantee you that they didn't put you in the other apartment on purpose,or overbooking. They really had a problem with bathroom. Split's Diocletian Palace is a gem of a place to stay for a couple of nights and this is the location to enjoy it to the full. 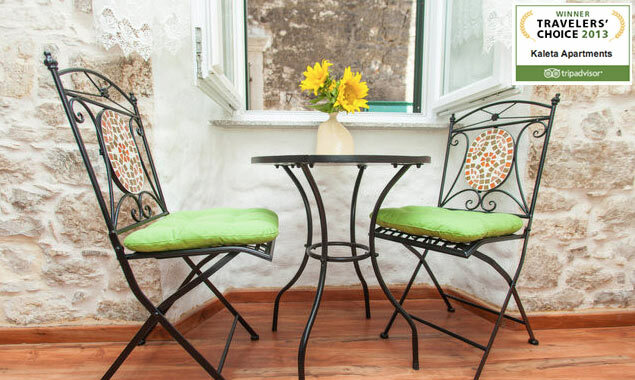 We stayed in Kaleta Apartment 2 - a one-room studio that is situated above a busy street cafe. Thelocation is perfect as it allows you access to all parts of the Old Town within a few minutes walk. Do not take a car! It would be more nuisance than it's worth. The noise from the cafe was no more than a pleasant hum withthe windows closed (and there's AC if you need it). The studio has everything you might need for a few days' stay including free WiFi which is very useful. The owner was pleasant and very helpful. We thoroughly enjoyed the atmosphere and the huge variety of "free music" in the various squares and on the Riva in the evenings. We stayed at Kaleta for 2 nights and the location is perfect. The host met us at the bus station and walked us to the room and gave us good advice on where to eat and sight see along the way. We stayed in their new apartment which is more towards the centre. It is clean and a good value. The location was excellent! The owners were very nice and pointed us to a wonderful restaurant. Even though it is surrounded by bars and restaurants, the windows kept almost all the noise out. Wifi and laptop in the room. Loved staying here. "ABSOLUTELY BEAUTIFUL! A HOME AWAY FROM HOME!" We normally do not review the places we stay but in this instance we simply had to. After a long and action-packed tour through Eastern Europe we needed to unwind and were so glad to find that Kaleta apartments was everythingwe expected it to be. You will find there are not many hotels in the area, and even if you do, they are usually overpriced. Apartments are the best way to enjoy the Croatian cities. We were greeted by a lovely lady who was very helpful. We loved the decor of the apartment, very quaint yet rustic. It is in a very central location, a little difficult to find but given the directions from the owners, I believe it is manageable. Regarding the noise, there is a cafe below the apartments but when you close the shutters it blocks out most of the noise. It is within walking distance to the bus, train and ferry services. Overall, I could not recommend this apartment enough, it was a home away from home!! Though Split was not our fav destination in our 20 day holiday.. the rain had to do a lot with it :( ..kaleta apartments was easily one of the best rooms we stayed in!! A beautiful room thoughtfully furnished and equipped with a laptop /internet connection & a small kitchenette with the basics. It was a little difficult to find despite the directions given by the owners and you definitely need a mobile phone coz the owners dont stay there and we had to wait for nearly 15 mnis for them after we called.. so ensure you let them know your arrival details beforehand. The pub downstairs is easily one of the most lively places within the palace walls and we spent quite some time there both the nights that we were there. we had no problems with the noise that others have mentioned. We stayed in the apartments close to the golden gate. The house was composed by three rooms. on single close to the main door and two separated from the common area by a simple door that formed a sort of apartment in the aprtment. One of the room was bigger and had a nice kitchenette excelletn for breakfast. We actually never cooked anything. There is a refrigerator too. very good to keep fruit and somenthing to eat for lunch on the beach. The other room is smaller but spacious. Both bathrooms were good with a big shower. The door separating these 2 rooms from the lobby has glasses, some curtains would be useful to have more privacy. in the lobby there is a pc with free internet and there is free wifi in the rooms. and that was very convenient! the location is good close to the main spots of the city but outside of the diocletian palace (few steps away). the whole apartment was very clean and tidy, rooms were well decorated. "PERFECT LOCATION, CLEAN, AND COMFORTABLE!" We stayed here for two nights in early August. Everything was exactly as reviewers had described--awesome central location, a clean and cozy interior, and a very impressive shower with multiple jets! (although I had to be careful not to get the floor all wet!) We had no problem phoning the manager and finding the apartment--he was sitting right in the cafe when we arrived and recognized us by our suitcases. We didn't find the cafe noisy at all, but I think the aircon in our room helped drown out some of the noise. The kitchen was stocked with enough pots and pans to make most anything you'd like (I made crepes for breakfast). Only downside I can think of is that you have to phone when you arrive, but the extra cost of that was minimal compared to what a great stay this was--and at a great value (only 70 euro a night). Would definitely stay here again. The apartment is located in the very center part of the palace. Very comfortable, well furnished and functional. We could not expect more. We have stayed in split often on our way to korcula . this time we had two friends fron New Zealand with us on their first visit to croatia. the apartments we stayed in were adjoining and were very clean and quite spacious. ours had a dining room and kitchen and a separate ensuite while the adjoining one had a bedroom and ensuite. they were on the second floor but the stairs were very wide so was easy to carry the bags up. 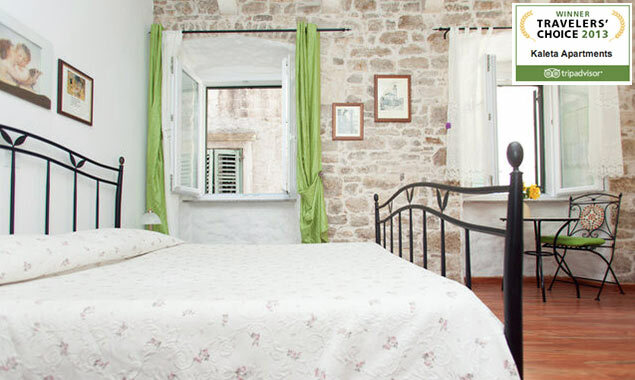 it was situated just outside the diocletian palace and about 80 metres from the waterfront. there was a laptop available in the apartment for our use and free wifi. all in all agreat place to stay with all the facilities you need.